Ahhh, the aroma of a fresh, mouthwatering, roasting turkey in the oven, Mom's cornbread stuffing cooling on the counter, sweet, spicy pumpkin pie tempting your passions. But don't forget the happy, little furry-feet, following your every move! Yep, its Thanksgiving! 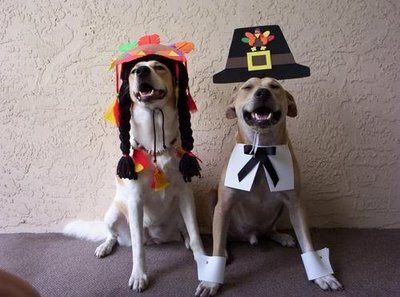 A time to be thankful for all we have, for those around us we love, including our canine friends. Many people share the family feast with their dog in an offering of thanks and love. While this is an innocent and seemingly gracious and loving gesture, the truth is, it's more loving not to share your holiday meals with your dog. While it may seem that a little bit of turkey skin here and a little bit of stuffing there wouldn't hurt, we know how quickly the pounds can add up over the holiday season. The same rules that apply to us apply to our pets. A diet high in fat and being overweight is very unhealthy for them. Pancreatitis is just one of the problems that occur with a high fat and unhealthy diet. The "typical" pancreatitis victim is middle-aged or older and overweight. It's common in both sexes, and very often the family has just had a party or a big holiday meal when this disease strikes. So, if your pet is often one that gets a table scrap here, a potato chip there, extra caution should be taken, as his possibility for an accute pacreatitis attack could already be high. However this doesn't OK you to indulge him if it's "just this once" or "just for the holiday." Things can turn bad quickly and with the hustle and bustle of the holidays; you may not be as alert to the first symptoms, or may pass them off as just nerves, stress or having a little too much turkey or all the family at the home for the holiday. The pancreas produces digestive enzymes that break down food so the body can digest it. These enzymes are carefully handled by the pancreas in order to prevent them from damaging the pancreas itself or surrounding tissue. If they break down for any reason, the result is leakage of enzymes, which damage the pancreas and any surrounding tissue they reach. This breakdown is called pancreatitis. Symptoms include loss of appetite, severe and frequent vomiting, diarrhea that may contain blood, reluctance to walk, weakness, pain, crying, restlessness, irritability, or refusing to eat. Many people know their dog is sick, but may be confused as to whether or not it's serious because of a lack of symptoms or symptoms being vague and mild. Pancreatitis may occur only once in a dog's life or it can become chronic, a condition that returns over and over again. It can quickly become fatal or just be a mild attack of pain that is over in a few hours or a day or so. It can cause serious side effects including shock, blood clotting disorders, heart arrythmias, and liver or kidney damage. So if your pet exhibits ANY of these signs, even if mild at first, get him to your vet immediately! Of course with it being a holiday, many animal clinics may be closed - another VERY valid reason to not be so sharing with your pets this Thanksgiving. And just in case, make sure you have an emergency number for your vet or the emergency vet clinic number handy for when your vet's office is closed. Make sure your pet has no access to any food left on the counters or tables when no one is around. After you're done cleaning up the kitchen, make sure you take the garbage out, and dispose of it in a secure place where no pets can get into it. Even the best behaved, well trained pets may be too tempted with turkey bones, the string that tied the turkey legs together, and what little of what was left of Mom's stuffing in the trash. Besides table scraps being dangerous to your pets because of the high-fat in some of them, there are still other reasons to not share your holiday feast with pets. 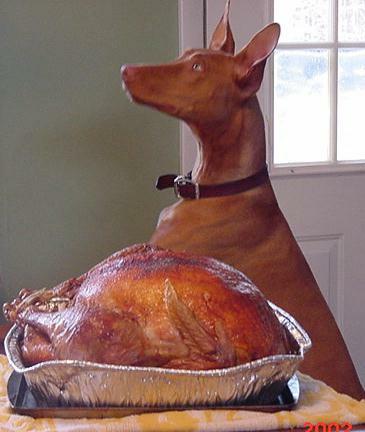 Cooked turkey, duck, geese and other bird bones are dangerous to your pet. They are hollow and break and splinter easily. Also, because they are so easily breakable, dogs usually won't chew them thoroughly. The results are sharp pieces that can choke the dog or block, tear the intestines. A pet that has a bone or fragment of one lodged in his intestine may not even show symptoms for a few days. When they do occur they may include loss of appetite, depression, vomiting, or diarrhea. Sometimes the bone will pass by itself; other times it may need to be surgically removed. So make sure all left overs and throw away and out of your pets' reach. Yet another danger to dogs is chocolate. It contains a xanthine compound called theobromine. Theobromine is highest in dark chocolate, but even milk chocolate contains theobromine. Chocolate can be fatal to your dog! Bowls of candy, or pieces dropped by guests or children, may go unnoticed by you for hours, but pose a real risk to your pets. Bloat is a medical emergency! One last word of caution on holiday meals and your pet is "bloat." Bloat is a gastric condition that can be deadly and is an EMERGENCY for you and your dog. Bloat is most commonly caused by too much gas or fluid in the stomach. This gas can extend the stomach causing gastric dilation. If the stomach partially rotates it is called gastric torsion. If it fully rotates its called gastric volvolus. Each can be a life threatening problem. Usually, large, deep-chested dogs are the victims, but it has occurred in some smaller breeds and puppies that have been allowed to eat too fast. While the causes of bloat are varied, gulping of food and water, a common behavior at excitable times when yummy treats are given and then exercise, such as the excitability and playfulness a lot of pets experience during busy times like holidays and family gatherings, may be a serious threat to a lot of pets. Bloat is a deadly condition that gives you a very limited amount of time to act. Symptoms include abdominal distention, salivating, retching, restlessness, depression, lethargy, anorexia, weakness, or a rapid heart rate. Any of these symptoms, even if mild at first, should IMMEDIATELY be attended to by your vet. The stages and manifestations of this condition can happen rapidly once started, so no time should be wasted in seeking advice and care, even if there is a little doubt. Things to avoid are not allowing your pet to overeat, even his own food. Instead of 1 or 2 large meals a day, try 3 or 4 smaller ones. Do not feed your pet at high excitability times, or when he's nervous, such as when you have a house full of company. Many dogs will gulp down their food as a "defense" to keep these "strange intruders" out of it. Calm your dog and feed him at quiet times of the day. Do not allow vigorous exercise before or after your pet has eaten. Be careful with your pets this holiday season, and be truly thankful for them by keeping them healthy!